The Realme 1 has decent performance and features. It heats up a little when using the camera app with stickers feature for a while. Haven&apos;t faced any lags or other issues yet. Dual 4G VoLTE works fine, call quality is good. The major drawback of this device is that the memory management is very very poor, which means pathetic multitasking performance. This is overall a good phone. Oppo Realme 1 is so far the best budget device I&apos;ve used in quite a while. I really liked the new design which brand tried to give in this budget. This design gives the smartphone a premium feel. At this price, that is pretty cool. Internal specifications are great you will not face any issue in performance whatsoever. The 32GB internal variant might not be enough for you. It is least not for me. Overall, I will give a positive review to this device. Looking to see more devices from Realme. OS is not that good. Shifted from Xiaomi camp to Oppo after seeing the features vs price, since Note 5 pro was not freely available. After using Realme for a week, I am now neither happy nor very sad.Overall, the phone is good and performance more or less similar to Redmi Note 5 pro. Would not recommend though. Go for redmi note 5 pro. Out of 3GB Ram, only 1 Gb is free, Ram management is bad Camera not up to the mark. Face unlock is fastest it unlocks even in very low light conditions. Front camera is good but beauty mode is whitening the face too much..
Back camera is very good both camera have auto HDR option which is awesome! A budget smartphone from the brand which redefines how a smartphone at this price segment can look. It comes with a unique diamondback which looks and feels premium. 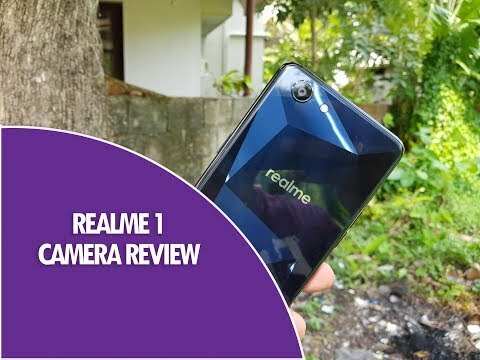 When it comes to quality, no other smartphone can beat Realme 1. Coming to the performance, it is packed with a fast chipset which delivers incredible performance. It does not have a fingerprint sensor but don&apos;t worry the face recognition tech inside is pretty fast. 11 Pricebaba users have written their experience with Realme 1. If you own Realme 1, please do leave your feedback too. On the front, the Realme 1 has a Full HD+ display spanning 6-inches. The display resolution measures 2160 x 1080 pixels which roughly translates to 402.49 PPI pixel density. The device has thin bezels on the side and sports a 18:9 aspect ratio display for an immersive viewing experience. The Realme 1 flaunts a stylish design with a diamond shaped pattern on the back. There is a micro-USB connector port for charging and a 3.5mm headphone jack for plugging in any audio accessories. In the camera department, the Realme 1 features a 13MP rear shooter with PDAF system and LED flash which helps in taking better pictures in low light. On the front, there is an 8MP sensor fitted for clicking selfies and video calling purposes. The phone offers AI Beauty 2.0 feature that enhances selfie images. A face unlock feature compensates for the absent fingerprint sensor. Under the hood, the Realme 1 houses a 2GHz MediaTek Helio P60 octa-core chipset. For seamless multitasking, it packs 3GB RAM and a Mali G-72 MP3 graphics processor onboard. As for storage, the device offers 32GB internal memory with an option to expand up to 256GB via microSD card slot. The Realme 1 runs on Android 8.1 Oreo OS with Oppo’s custom ColorOS 5.0 skinned on the top. The Realme 1 is powered by a 3410 mAh non-removable battery unit. It offers dual SIM functionalities along with dual 4G VoLTE connectivity which lets you run 2 VoLTE SIM cards simultaneously. For networking, the Realme 1 offers all the basic connectivity options like 4G LTE, 3G, 2G, WiFi, & Bluetooth. 1.Does the phone support dual 4G VoLTE connectivity? Ans: Yes, the Realme 1 offers dual 4G VoLTE connectivity. 2. Does this phone support Reliance Jio network? Ans: Since this phone supports VoLTE connectivity, Reliance Jio will work easily. 3. Is this phone good for selfies? Ans: The Realme 1 has a 8MP front camera which is capable of clicking good quality selfies. Ans: No, the device battery is not user-removable. 5. Does it support OTG? Ans: Yes, the Realme 1 supports OTG cable.